When the Lord Jesus caught Len up in the Spirit and took him to the other side of the world, it naturally had a tremendous impact on his life. 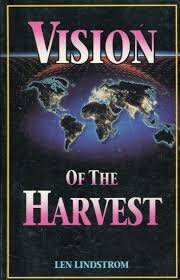 Having seen in a vision the vast multitudes of lost, eternal souls, he obeyed the Master's Call to the Harvest of the Nations. As you travel with him and his wife Julie through these pages you will truly sense that you have stepped into the Book of Acts in the Twentieth Century. Share the emotion, the excitement and the compassion for the multitudes of lost souls around the world. Discover the dynamics of Miracle Ministry, both needed and available to reach the masses today. Stand with them amidst adverse circumstances, persecution and threats upon their lives. See the delivering hand of God intervene miraculously in every situation. Experience the had of God as the blind see, the deaf hear, the dumb talk, and the cripples walk, just the same as they did in Bible Days. Watch as anywhere up to 15,000 souls respond to Christ in a single alter call, after seeing the reality of the Risen Lord's presence. Realize that Jesus Christ is still proving Himself to be the same yesterday, today, and forever. You won't be the same after you read this book. Join Our Facebook Page For 10% Discount On Most In-Stock DIRECT Purchases!!! Devotions For Dieters - PB - A 365-Day Devotional For A Lighter You!